The Grand Bleu de Gascogne is a Scenthound of ancient lineage, eminently French. They are descended from the original scenting dogs of Gaul and the Phoenician hound trade, and are one of the two types from which most modern hound breeds developed. The Grand is probably the closest, of the four Bleu de Gascogne breeds, to the ancient hounds in size and build. Gascony Province, the specific area of their root-stock and development, is located on the southwestern coast of France. 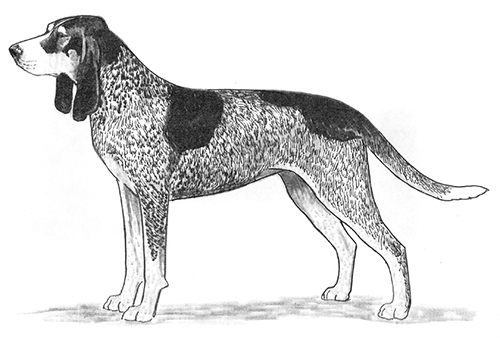 The Grand Bleu de Gascogne is first and fundamentally a hunting/working breed, a trail hound "par excellence,” which has retained the extreme physical and hunting characteristics of its ancient stem. Every point of the Grand Bleu de Gascogne is for a purpose relevant to preserving the breed and its uniqueness. 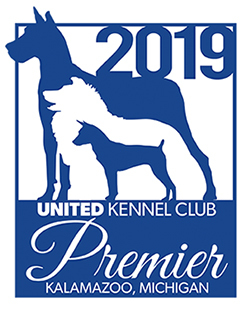 Judges are asked by the sponsoring breed club to keep this fact in mind when evaluating the merits of an individual hound. The Grand Bleu de Gascogne was recognized by the United Kennel Club in January 1991. The coat and expression combine to form an incomparable group. Its color, build and head combine to form an impression that is very noble and very French. The first and immediate impression of a Grand Bleu de Gascogne should be that of a hound with substance and staying power. Considering the breed's long hunting history, individual hounds should have moderate bone and ample muscle. Males are heavier than females. Defects such as bull necks, out at the elbow, loaded shoulders, or a "beef steer" profile, should not be confused with masculinity. Likewise, defects such as a shallow muzzle, poorly formed chest, extremely narrow pelvic region and general frailty should not be confused with femininity. A trail hound of moderate speed, which at creation was used to hunt wolves but since the demise of the wolf, has since successfully adapted to hunting wild boar, deer, fox and hare. The Grand Bleu de Gascogne hunts in a leisurely, methodical manner and possesses, in the extreme, a great amount of determination, tremendous endurance, desire, self confidence, sagacity, remarkable scenting ability, a deep, powerful melodious voice, a distinct coat color and an aristocratic form. Of even temperament, essentially friendly. Some individuals may be very outgoing, while others are somewhat reserved in nature, but never shy or vicious. As a hunting/working Scenthound breed, and being called upon to work in close proximity with other hounds and their handlers, aggression towards other hounds and people is to be considered a fault. Extreme shyness or viciousness is a disqualification. Strong and elongated in shape. The skin that covers it is loose and forms one or two wrinkles on the cheeks. Narrow rather than wide, and slightly convex. The occiput is well pronounced. Frontal bones are prominent. The stop is only barely defined. Long, strong and slightly aquiline. The lips are pendulous, well covering the lower jaw. The corners of the lips are well marked. The ears constitute one of the identifying features of the breed. They are attached very low, are thin and well twisted inward, tapering to a point. The length must reach at least to the tip of the nose and is often longer. The chest is long and broad, and let down to elbow level. The forechest is well developed. The back is rather long but firm. The loin is short and broad, and the croup is sloping, which emphasizes the hipbones. The flanks are deep and flat. Rather thick, and long enough to reach the hock, with a slight brush towards the tip, the tail is carried in saber fashion. Measured at the point of the withers. Males: 25½ inches to 27½ inches. Females: 23½ inches to 25½ inches. Because the Grand Bleu de Gascogne is first and foremost a hunting hound, scars, the result of honorable wounds, shall not be considered faults, nor shall they be penalized by Judges. This includes cuts, nicks, notches on the ears and/or ears which are frayed at the edges from working in brush, tail grass, etc.